My inspiration for the clothes I design is a strong dominant woman; a powerful and knowledgeable woman that doesn’t fear the combination of strength and femininity. Her look is feminine and precise; she is a woman looking for convenience and chic. I define the style as a “tailored urban casual style”. Eggplant violet is a rich, sensual, noble color. In the Roman Empire days, violet clothing was preserved for the upper class. I used two shades of violet in this blouse for emphasis and interest. The dominant shade is dark eggplant violet. 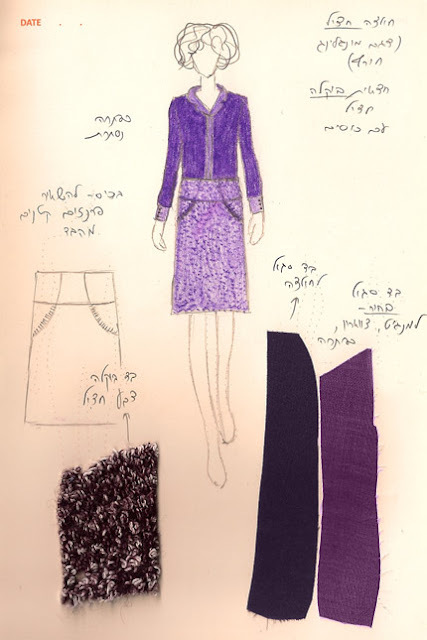 The light violet shade is in the sleeve cuffs, the collar and the hidden buttoning. The fabrics are batiste cotton, soft and of high quality.